This is a COMPLETE 3-in-1 training system that will sharpen your tactics, calculation and visualization skills. Modern chess, thanks to our ‘silicon friends’ Fritz, Houdini, and company, have advanced to a level that is never seen before! Just have a look at today’s GM games – full of tactical twists and turns, intense fight for the initiative, sacrifices for dynamic compensation, and mind-boggling complications in ALL phases of the game. Gone Are The Days When You Can Single-Mindedly Follow An Abstract Plan And Win Games! …You will continuously get outclassed by players who are strong in these departments. You will LOSE to a tactical oversight after playing 40 good moves game after game after game. You will NOT realize your FULL chess potential. You only have two choices: adapt to this trend or be left out frustrated as your chess results rot away and your progress stalled. So what is the improving chess amateur to do!? Are you still with me? Have you decided to keep up with the trend and play DYNAMIC chess? Good! That goes to show that you really want to get better at chess. But now, we come to another cross-road… another branching point where you have to make a crucial choice. When it comes to training tactics, calculation, and visualization skills, you ONLY have 2 options. 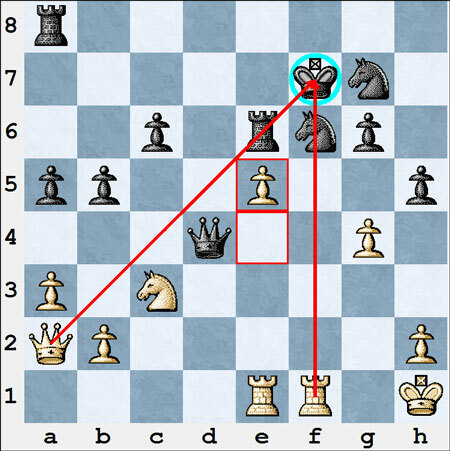 (2) reading or watching game analysis of strong tactical GMs. Take a close and objective look at the chess DVDs, databases, training software & programs, etc. You will soon realize that, while their titles are different, they are published by different authors, ALL of them only offer either or both of the above training methods. So what’s the problem with that? A BIG ONE I’d have to say! I’m pretty sure you have solved & waded through thousands of tactical exercises yourself, and watched GMs like Anand, Shirov, Kasparov, and other heavy-weights analyze their very best and most entertaining games. Can You HONESTLY Say That Your Tactical Skills Got BETTER, Your Calculation Got More EFFICIENT, And Your Chess Vision Got SHARPER? I bet NO, otherwise, you wouldn’t be here in search of a SOLID and RELIABLE way to take your dynamic chess skills to the next level! Yes, the well-known methods are lacking. They are easy to do: just solve puzzles and check the solution, sit back and relax as your favorite players comment their games. However, when it comes to the improving your game, they’re a cut or two short. You can stick with the traditional methods of training your tactics, calculation, and visualization skills… which DON’T bring significant progress. One That Has CONSISTENTLY Brought Success! Increase in their chess rating by leaps and bounds (100-300 rating points increase). Win more tournaments and bag BIGGER and BETTER prizes. Win games in BRILLIANT and BREATH-TAKING fashion. And even convincingly grab GM and IM norms! These are just to name some of the AMAZING successes of my chess students and friends. And if that sounds like a good deal to you, then my BRAND-NEW course – “CALCULATE TILL MATE” is for you! 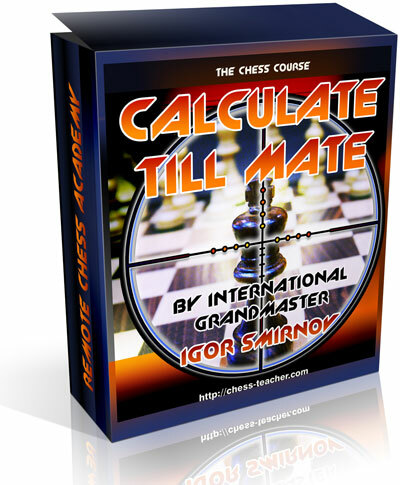 No fluff and no hype – “CALCULATE TILL MATE” is a COMPLETE and UNIQUE 3-in-1 training system that will sharpen your tactics, calculation, and visualization skills like no other chess book, DVD, or training program could. To WIN MORE games, and win them in fine attacking, tactical, & entertaining style that will win your fellow players’ admiration. To learn how to calculate like a strong Grandmaster. To completely eliminate blunders from your play. To find tactical blows in most game you play and nuke your opponents with them. To visualize moves and variations CLEARLY and EFFORTLESSLY. An efficient and strong thinking system that GM’s use day-in and day-out. Training techniques that will only further improve your play. These techniques cannot be found in any of the books today! Mental shortcuts that will cut the time you spend in analyzing positions and calculating variations in half. Improve your concentration, memory, visualization, and other cognitive skills that are valuable in daily life. YES, you will be a stronger chess player with a keen eye for tactics and ready to WIN more games and tournaments! I know what you are thinking: “This all sounds good. But what exactly do I get when I get the course?” A LOT! 9 Video Lessons (309 minutes) – And these are not your average chess videos. I have stripped the fat and you are guaranteed to get info-packed lessons that are filled with practical advice for sharpening your tactics, calculation, and visualization skills. Hundreds of Special Tasks & Games – Built from the ground up to make sure the lessons in the videos stick and to help you develop the necessary skills, these special tasks and games are deeply analyzed and commented for maximum learning potential. Detailed Instructions On WHAT And HOW Exactly You Should Train – I’m a step-by-step kind of guy & I hate leaving my students in the dark. I will show you what skills you should train to get the best bang for your time and how precisely you should train it. No stone is left unturned! Completely Standalone – When you get the course, you get all of the programs necessary for using it. No need to buy anything else! Answers To ALL Your Questions About Tactics, Calculation, And Visualization – Before releasing this course, I asked thousands of subscribers to submit their questions relating to the topic my course covers. And this course contains the answers to the most common, most interesting, and most instructive questions I got. Now, I’m the type of chess coach and GM who wants to make sure you know what you are getting… and I’m also pretty sure you are excited to know what’s inside the videos.. Eight chess lectures oozing with game-changing training methods and tools are waiting for you! LECTURE #1: Deepest And Most Fundamental Tactical Knowledge! The very first video lesson is all about setting the SOLID and RIGHT foundations for the intense training and games ahead. No fillers in this video, we get down to business right away by showing you the DEEPEST and MOST FUNDAMENTAL tactical knowledge. The whole calculation process summarized in a nutshell. The compass for forming plans and calculating variations – main strategic goal of a chess game. When to MAINTAIN or BREAK contact and tension.. Your training to be a world-class calculator continues with this video lesson. Building up from the previous video, I will REVEAL. What it’s IMPORTANT to do BEFORE any calculation.! 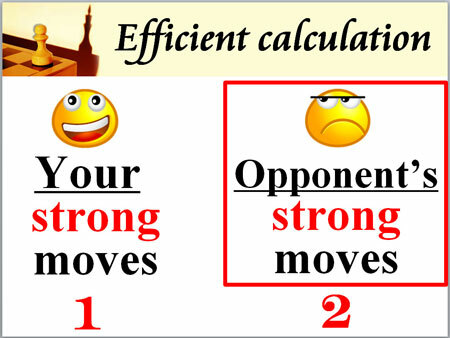 Which moves you should calculate first.! What you should keep in mind when calculating and predicting your opponent’s next move. The compass for forming plans and calculating variations – main strategic goal of a chess game.. The “Comparison” & “Elimination” Method and how useful they are when calculating. And tons of other ‘no non-sense’ and practical tips and techniques! With the thorough explanation about the process of calculation provided on Lecture #2, it’s now time to get down on specific techniques and tricks to make you a SHARPER and far more EFFICIENT calculator! And those are just to name a few! Applying ALL of the techniques and tips from the previous lesson will make you a formidable player, but we will take your performance level up another notch with this lesson! We will weed out the bad mental approaches from the good. One of the MOST HARMFUL things most players do in real games. Correct mental approach during your practical games. How to avoid time-trouble and what you should do if you find yourself running out of time. And other juicy and very useful mental tools and approaches that can only boost your game!. In the previous lessons, the whole calculation process has been ripped apart into bite-sized and easy-to-digest chunks. For the fifth lesson, the spotlight focuses on combinations! Yeah, the stuff that has and continues to mesmerize and motivate us to play chess! But this time, you are more than a spectator to jaw-dropping combinations. You will learn how to produce these sparkling combinations and sacrifices in your own games! Learn what a combination is and how you can apply them in your own games. The interplay of activity and material, and how these two factors strongly influence your choice of moves and make combinations possible.. The different types of sacrifices and the advantages they bring. What to do when you are ahead in the ‘activity department’ and HOW to gain such an ADVANTAGE. Where you should attack (there are 3 important factors to keep an eye on). The definition of tactical weakness and how you can spot them. Why attacking and marching forward whenever possible is IMPORTANT! After this lesson, you will have a solid and deeply-grounded understanding of combinations…and finding and playing them on your games will be so MUCH easier! Understanding how combinations work and having the right mental approach and tools will make it 10 times easier to find and play such ‘shockers’. Now, imagine if you learn ALL of the main combinations? That would only sharpen your combinational and tactical vision! And that’s precisely what you will get in the 6th lesson. I will show you all of the typical combinations that should be in your arsenal. The REAL importance of knowing typical combinations… and WHY overdoing your study about these would lead to diminishing returns. More on sacrifices, and why you should play them even if it’s impossible to calculate it down to a win. LECTURE #7: Training And Bringing Your Skills To Practice! With the 6 previous lessons, the focus was giving you the right tools and orienting you on the necessary skills needed for improving your tactics, calculation, and visualization by leaps and bounds. How to PROPERLY analyze games of STRONG attacking players. What questions you should ask when analyzing to train your understanding of chess THOROUGHLY. How to train your calculation system and the IMPORTANCE of IDEAL calculation in this process. How to improve your knowledge of typical combinations 10 times better than just solving tactical exercises from a book or chess database. the course’s unique training program. No chess improvement program would be complete without the MUCH-NEEDED training program to make sure lessons sink in and to automate the skills necessary to transform your game and chess performance. We now come to my most favorite part of the course – the Practical Part. Day-in and day-out, following this program down to the “T” will let you experience the AMAZING progress and success that my private students have been enjoying in secret! These tasks have been built from the ground up to make sure that your tactics, calculation, and visualization skills get the MASSIVE boost it needs! From writing down your current calculation system to pinpoint deficiencies, analyzing strategically and tactically complex positions, naming the combinational motifs used, to playing and replaying games blindfold, “Calculate Till Mate” covers ALL! The MAIN Tasks Are STEP-BY-STEP! – They are carefully designed and sequenced to develop your visualization technique and blindfold skills in the BEST way possible! These are not rehashed from other sources and chess books! Long hours have been spent to make sure that you get the MOST instructive and challenging chess positions and games. Study them and CAREFULLY follow the steps and you will be rewarded with MORE rating points and MORE wins! Note: These tasks are NOT easy. They will push you and your chess skills to the LIMIT… and going through them CAREFULLY, through the DETAILED steps I outline, will reward you with enhanced tactical ‘muscles’, calculation skills with laser-like precision, and visualization skills with UNRIVALED clarity! Principles without giving you any idea how to use them – this is the biggest mistakes chess books make. But “CALCULATE TILL MATE” fills the gap by showing you not just the principles and components of a good chess thought process… I will show you how to put them together for maximum improvement! I’ll hand-hold you throughout the process, to make sure you do everything right! After careful study of the course and religiously doing the tasks, you will be transformed to a UNIVERSAL player who can play good positional moves, build up his position, and play swashbuckling tactical blows when the chance arises! ALL of the programs necessary for the course. You don’t need to buy additional programs or chess software to take FULL ADVANTAGE of this course. Please, be reminded that it works under the Windows Platform ONLY. Aside from the video lesson, you also get the text version of the lessons filled with diagrams for easy reading. This is PERFECT for those who learn more out of reading and want to play through the examples in a REAL board..
NO shipping and handling fees needed! After purchase, you will be given a special link for downloading the course after purchase. After you hit the “Buy Now” button, you can get started in your chess training within minutes! With a TOTAL file size of 250 MB, you shouldn’t have any problems downloading it… and that means you can get started on your training QUICKLY! If you have any technical problems, I’m just an email away. Visit our support zone and we’ll get things sorted out. And for the ‘Early Birds’ who grab the course now, you will enjoy the following BONUSES that will further sharpen your skills on the art of tactics, calculation, and visualization. THE BONUSES ARE BUILT DIRECTLY INTO THE CALCULATE TILL MATE PROGRAM IN THE BONUSES SECTION. VALUE: 39 USD - FREE of charge! With this video, I will show you EXACTLY how Grandmasters think in a chess game. Together, we will pick their brains out with the help of the thinking techniques and tools that I have elaborated throughout the course. No, this isn’t like the videos you’ll find on “My Best Game” DVD collection of today’s best players where you get bombarded by one variation after another. It’s impressive but not instructive..
VALUE: 39 USD -- FREE of charge! A lot of work went through in compiling this collection! And you can grab this ONLY HERE (and for FREE!). But be warned: this GREAT BONUS isn’t going to be around forever and I can take it off of the package when I see fit. This bonus game collection will augment your training and take your skills to the next level. FULLY understanding and analyzing these games will really stretch your calculation skills to the limit! And the end result after studying this game collection is that you’ll be a MORE POWERFUL and EFFICIENT calculating machine. Analyzing games of Morphy, Alekhine, and other old school tactical masters is nice, but let’s be real, A LOT of time has gone since then..
People went into outer space, mobile phones have been developed,and A LOT of progress has been made in chess, too. That’s especially true in the art of defense. Pulling off tactics and blows would be met with the toughest defense. So what should we do? Here’s what: analyze tactics from modern games… learn how to execute winning blows despite tough defense from your opponents. That’s exactly what you’ll get in this bonus. We’ve analyzed all of the games from the 2012 Euro Championship, and selected all tactical shots. Now, you can study the most RECENT examples and displays of dynamic chess by the STRONGEST players!! Through deep and exacting research, we picked out the best modern attacking players. With careful and objective analysis, we’re able to pick out their very best attacking games! You can study the best of the best: the most effective attacking techniques of modern players. Carefully and deeply study these breath-taking games, and you will play like the masters of attack in no time! This Course Is NOT Intended For Everyone! This course is for SERIOUS students only. You see, it could take months to FULLY understand and develop the skills that this course aims to sharpen. BUT, if you are ready to put in the effort, to watch ALL of the info-packed video lessons, to perform ALL of tasks as I have instructed, then mark my words: your calculation, visualization, and tactical skills will go off the roof! It will move up to 100 to 300 rating points…and that’s just the average. My students and friends have done it, and YOU can DO it, too! All I need from you is a commitment – a commitment to be better at chess by CAREFULLY and DEEPLY studying this course. Once you have that commitment, I will guarantee your chess progress! I will also bear all of the RISKS! 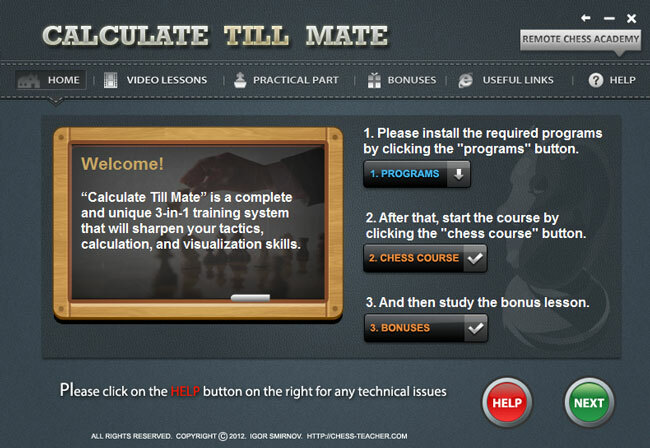 Buy the course “Calculate Till Mate” now and study it seriously. Learn the video lessons and complete all of the practical part tasks (following the corresponding instructions). Then apply these skills in your practical games. If you do not realize (after the study of the course) how to apply the course’s skills, which I explained and if you do not make any progress – then I will refund you 100% of the price. Just contact me via the “contacts” section of this website, and you will receive the money back. Unfortunately, if our teaching methods are not suitable for you, you might not be allowed to purchase any of our products in the future. You may read more details in our refund policy. To sum it up, buying the course is RISK-FREE! There’s no way you can lose. 9 info-packed video lectures (309 minutes). The text version of every video lesson (for printing). Hundreds of special tasks and games to develop those skills. KEY Materials for printing that will make reviewing and remembering the lessons a breeze. Detailed instructions about WHAT and HOW exactly you should train..
It’s NOT just theory! It comes with concrete examples, with commentaries, about how exactly you should apply MY recommendations..
4 GREAT BONUSES (video, tasks etc). All answers to your questions about tactics and calculation. All the programs necessary to use the course properly. If you want to play in the same style (and same level!) of strong tactical players, I will show you the way to do it in months! The risk is ALL on ME with the 31-Day Iron-Clad Money Back Guarantee. Give yourself the chance to get better, RISK-FREE. You yourself will be amazed at your AMAZING and SPEEDY progress! How to Get The Course Now: First, click the order button below. Then choose the method of payment on the next web-page. Chess course: “Calculate Till Mate”. License: For your personal education. Delivery: Instant download after the payment.